New Year’s resolutions are great ways to work on improving your lifestyle, but why not make some to improve your dog’s quality of life too? Sit is a very versatile command that is easy to teach and can help improve your dog’s attention and focus while helping them learn some self-control. Everything from greeting someone, waiting at the door instead of running outside, to waiting patiently for their dinner or bedtime snack. You’ll be glad your dog knows this simple command and you’ll both love showing it off. This one is for you dog moms and dads! Make a commitment this year to be as consistent as possible in your rules and expectations with your dog. Dogs understand routine and do best when rules and expectations are black and white. Gray areas are confusing for them and can cause stress. If, for example, sometimes they’re allowed on the couch but other times they’re not that can be very stressful for them. Being inconsistent is often the cause of many behavior problems such as frustrated mouthing, jumping, or chewing. When your dog knows what it is you expect them to do, they will be well on their way to living a happier well-adjusted life. 3. Don’t put that in your mouth! “Leave it” might just save your dog’s life or at the very least save you a trip to the vet! Dogs have a nasty habit of getting into things they really shouldn’t. They’ll grab bits of food you drop before it even hits the floor. They’ll eat anything they can swallow. Sometimes it might be a harmless piece of meat or cheese, but other times it could be medications. They might find something dangerous or just plain gross on a walk. Whatever the situation may be, teaching your dog a “leave it” command could be the difference between continuing your day as normal, or making an expensive and potentially traumatizing trip to the vet. Come when called is always something that should be practiced on leash unless there is an emergency. We tend to overuse the “come” command with our dogs, and by doing so it has a tendency to turn into a “white noise” of sorts for our dogs. By only using “come” when your dog is on leash you will be able to be consistent and reinforce the behavior every single time. That way they will learn that you always mean it, and your dog will be more likely to listen to you in an emergency situation. Remember! An emergency situation means your dog is running towards the street and there is a car coming, not he/she won’t come in from the yard and you need to go to work. If you want to be able to safely work with your dog off leash, you should always do so with a qualified trainer who has experience with off leash training. Your dog’s recall is the most important command he/she will ever learn. So practice it often and in lots of different situations! For many owners taking their dog for a walk can be a chore. It’s hard to enjoy being outside with your best friend when you feel like they’re going to dislocate your arm, pull you down, or choke themselves! Teaching heel is a great way to get your walks under control and start enjoying your time out with your pooch. Heel is great for getting attention on you and having some structured time during your walk, but don’t forget to give your dog some time to be “free” on-leash to sniff and explore. Just make sure that your loose leash free time doesn’t involve dragging you up to every fun thing to sniff they can find. There still needs to be some boundaries! If you’re having a hard time getting your dog to work with you on your walks talk to our trainer about what options we may have to help. …in a safe and controlled environment! Everyone needs to get out and stretch their legs every now and then, and your dog is no different. 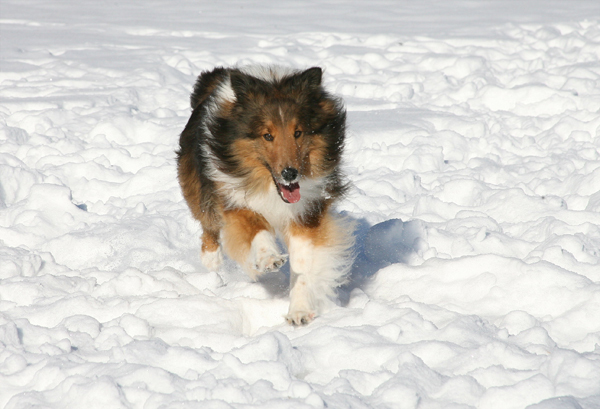 Some dogs just love to run – by providing them with a safe place to do this you will be adding another level of satisfaction and quality to their life. Always make sure that wherever you go to give your dog off-leash time is completely fenced and that the fence is tall enough that they can’t jump it to chase a squirrel, rabbit, or other critter. There are many options for giving your dog off-leash play time…some are more ideal than others. Having a fenced yard is great, but let’s face it – many of us live in townhomes or apartments and for those of us that do have houses the cost of installing a fence can be prohibitive. If you don’t have a fenced yard but Fluffy’s best friend next door does, try scheduling play dates for them! If that’s not an option, doggy daycare with an outdoor place space like Top Dog Country Club is the next best option. With trained staff and specific dog/human ratios this is the next safest option to let your dog run off-leash and make friends. Dog parks can be an option, but be cautious! Not every dog that comes to the dog park is friendly or vaccinated, and many owners take a stance of letting the dogs work out their problems. This can be very dangerous for your dog. If a dog is aggressive to your dog in any way or your dog is ever uncomfortable even if you don’t understand why, you should immediately remove them from the situation. Don’t wait for, or expect another owner, to get their dog. They may not be paying attention to their dog, and may not even understand what their body language is saying. Be your dog’s advocate and keep them safe. Likewise, if your dog is playing the role of bully, immediately remove them from the situation and reconsider the use of a dog park. You are responsible for the actions of your dog in this and every situation. Training your dog a ‘go to place’ command is certainly a worthy goal for this year! Choosing a comfortable bed as the ‘place’ your dog will be sent to during the training and then final application of the command will make the command more enjoyable for them. A ‘go to your bed’ trick is not only great to show off to your friends with, but also comes in very handy if your pup is begging for dinner. It’s also nice to have a place for your dog to go if they get too excited at the arrival of guests. Your dog can’t be jumping on someone or running out the door if they’re sitting nicely on their ‘place’. This one should be lighthearted and fun. Whatever you choose you should pick something that will be fun for both you and your dog. If you have a super active dog they may not enjoy a day on the couch watching Netflix. Likewise, if you have a more relaxed dog or maybe an older dog, they may not be up for a 10 mile hike or weekend camping trip. Don’t forget! Any training you do should be positive and upbeat - puppy, adult, or senior - if your dog isn’t having fun they won’t want to listen when it really matters.